It is a thin quadrilateral plate of bone, which creates the posteroinferior part of the nasal septum. Between both diverging alae, the superior border is thick and grooved. The groove fits over the sphenoidal rostrum. The body of sphenoid and vaginal process of medial pterygoid plate are intervened in between by margin of ala. The vomerovaginal canal is composed between the ala of vomer and vaginal process of medial pterygoid plates. Lower border articulates with all the nasal crest created by the maxillae and palatine bones of the 2 sides. Posterior border is free and separates the 2 posterior nasal apertures. Anterior border is longest and inclines downwards and forwards. In its upper part it articulates together with the perpendicular plate of ethmoid and in its lower part together with the septal cartilage. The lateral surface on every side is covered by a mucous membrane and is marked by an anteroinferior groove for nasopalatine nerve and vessels. The vomer is affected in all 3 types of Le Fort fractures of midfacial skeleton. The vomer is paper thin. A transverse fracture of vomer because of direct strike on the nose results in deviated nasal septum (DNS). Which of the following is not true about Vomer? The Vomer is affected in which type of the following fractures? 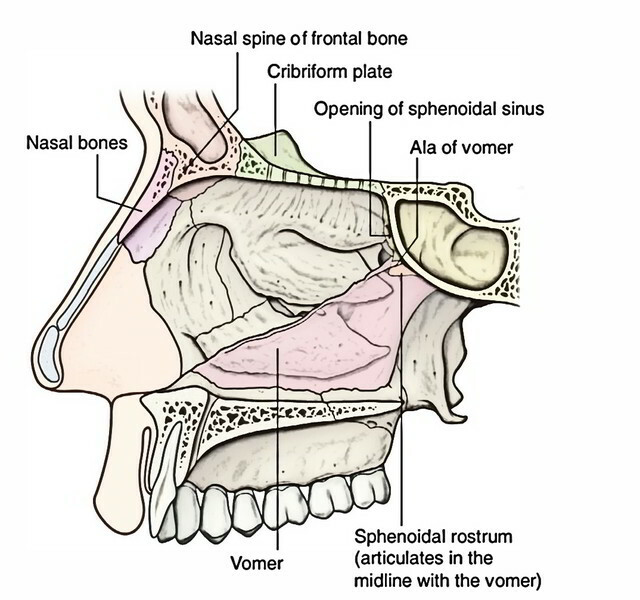 Vomer creates which part of the nasal septum? How many edges are present in the Vomer?